The Sony Alpha A7 delivers all of the advantages of a 35mm full frame image sensor and lens interchangeability in a truly compact body. The Sony A7 sports a 24 megapixel sensor into a beautifully crafted, robust magnesium alloy body and is the first compact system camera in the Sony E-mount range to feature a full-frame sensor. The intuitive layout and ergonomic design makes composing your shots through the bright, high-resolution XGA OLED Tru-Finder or via the high-contrast 3.0 tiltable LCD screen a breeze. The powerful BIONZ X image processor and responsive hybrid autofocus system ensure beautifully rendered, sharp and accurate results for both stills and Full HD videos, even in low light. 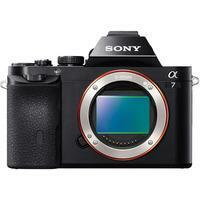 The Sony Alpha A7 also supports Wi-fi and NFC connectivity for wireless image transfer to a smartphone or tablet.